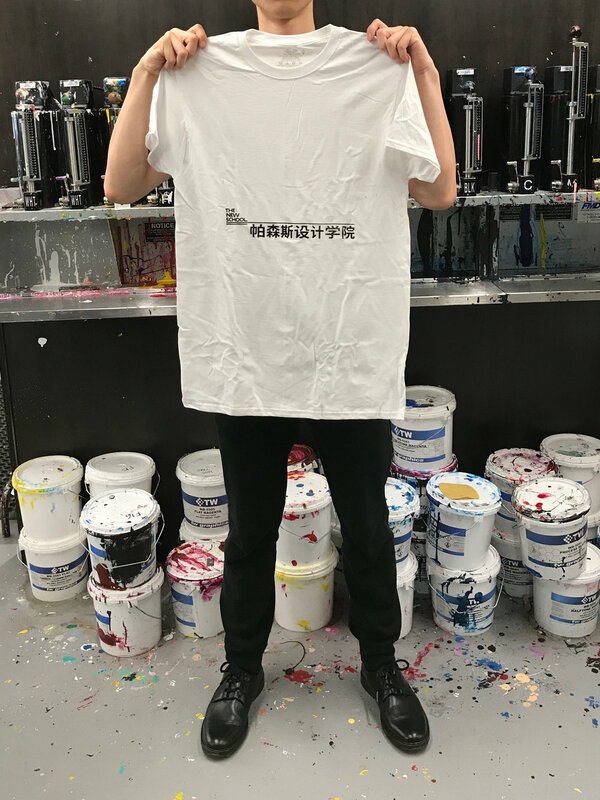 Two days before graduating Parsons, I did a T-shirt and totebag project with @chenghui_zhang in an effort to bring some fun to graduation (and do something stupid for ourselves). All the t-shirts and totebags were screen printed at Parsons by ourselves. We premiered the design on Instagram and Facebook Groups and started accepting pre-order from a web store page. To many students in Fashion, the thesis is a year long project that is almost equivalent to nine months of your life. At the beginning, everyone goes through an excitement and motivation phase, but usually just feel exhausting toward the end. As the school of Parsons and the whole university welcomes the commencement, we knew we had all survived our Thesis. When Paula Scher’s visual identity and typeface for The Newschool came out, everyone at Parsons was talking about how wide some of the characters appear. Separating the super wide “W” in The Newschool logo was suggested by Photography student Anna Ruback. Taking the NEVV into a Levi’s inspired graphic added more humor to the design. 帕森斯设计学院 is the Chinese translation of Parsons Design School. While there is no official attempt to showcase a Chinese logo, I adapted the words in the same composition as Paula Scher’s original logo, as well as altering the width of individual characters to reflect the horizontally expandable characteristic of the custom-created typeface Neue. Back in 2014, YOU NEVER LEAVE PARSONS was a campaign heavily advocated by Simon Collins, then Dean of Fashion at Parsons. Since housing the show Project Runway the iconic building in the garment district has been closely associated with the identity of Parsons Fashion. When it was sold and the fashion school moved downtown, this phrase in red was put up on the windows facing Fashion Avenue in such arrangement. On the day of sale, we set up tables in the University Centre Lobby and expected big traffic from both students and parents attending the series of graduation ceremonies. The Thesis Survivor series sold out after the first hour. Everything else sold out within the next two hours.